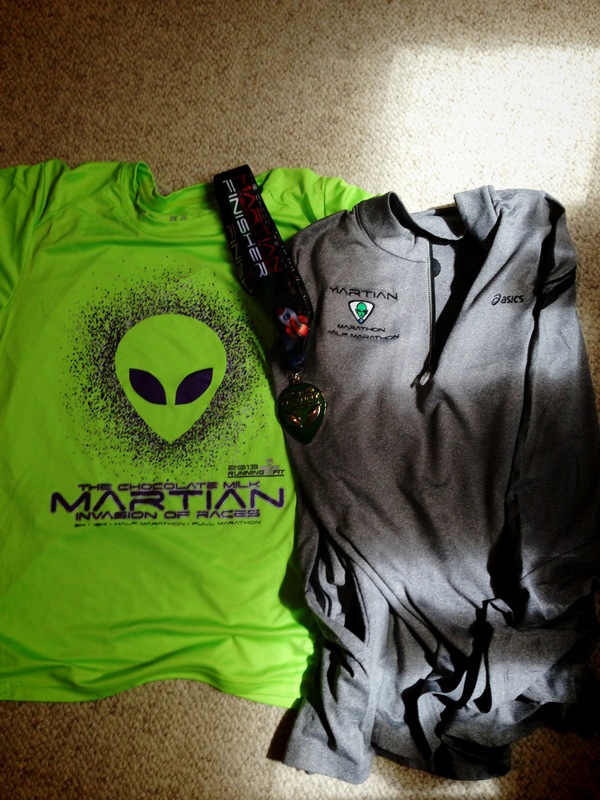 A little late, but here’s a (loooong) recap of the Martian Half Marathon! Race weekend started for me on Friday night, where I’d signed up to volunteer at the expo from 5:30 to 9:30. This is a smaller race, so the expo wasn’t huge, but there were still a few vendors and some Martian Marathon gear for sale. Ron and I raced home from work, changed, let the dogs out and fed them, and then raced to the expo. We arrived at 5 and spent some time shopping and then picked up our packets. 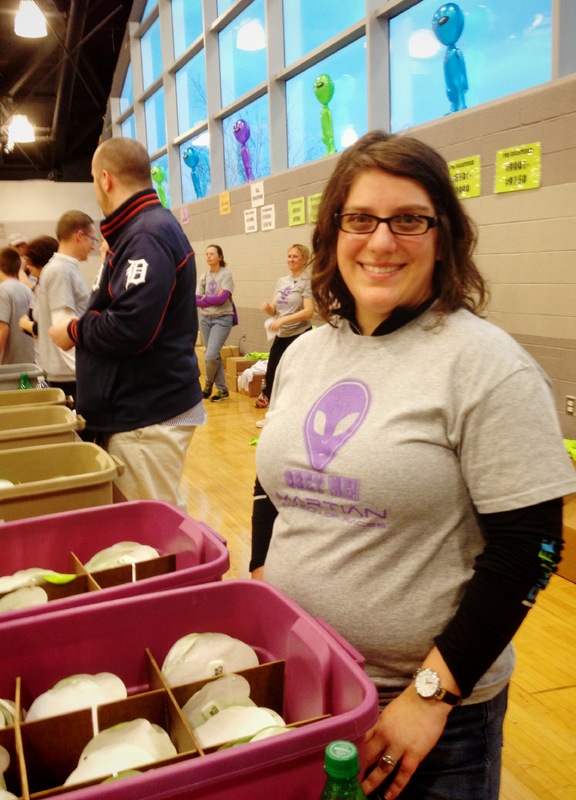 After checking in at the volunteer desk, we were told to see if anyone working the packet pick-up area needed a break. 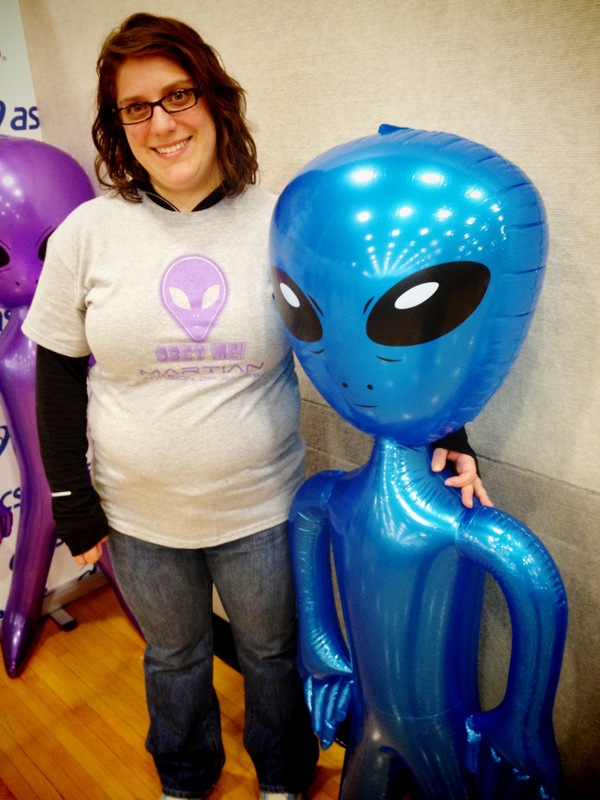 We ended up handing out bibs and shirts for the 10K. It was actually kind of fun, though also tiring. An hour in, I was surprised by how tired I was. Soon after, someone came around and told us to take a break. There was pizza and water they said, so off we went to find what would amount to dinner. 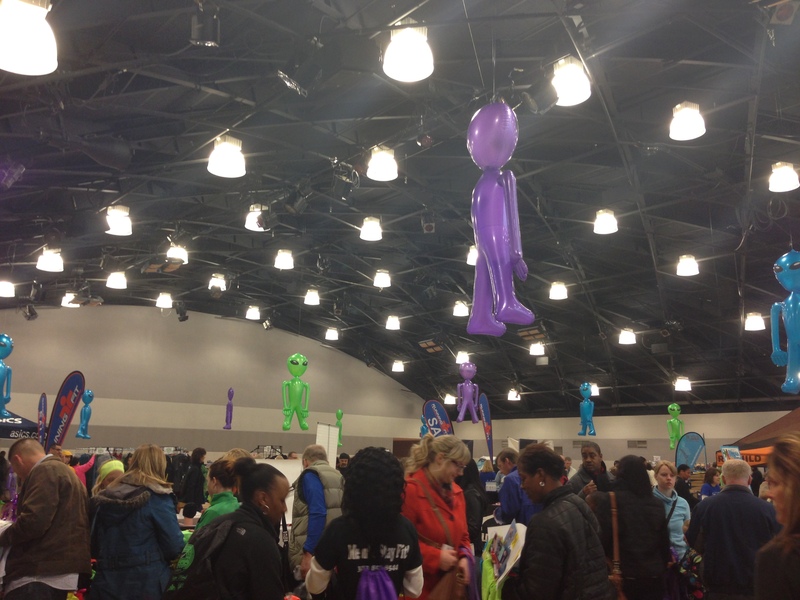 Martian Expo, Aliens are everywhere! What we also found was a meeting between the race director and the course marshals. Since the pizza was in the same room, we ate and listened as it was confirmed that the race course was going to change due to flooding. As long as the course marshals knew where to point us, I was pretty sure we’d be OK. I wasn’t going to share this, because I didn’t know how true it was, but a Thank You e-mail from the race director this week confirmed it. Not only was the original course flooded, but the back-up course couldn’t be used either because one of the roads was torn up! This race could have easily been cancelled with all the flooding and having to use a SECOND alternate course, so a big thanks to the race directors and the cities of Dearborn and Dearborn Heights who found somewhere for us to run! The expo ended at 8 and we helped tear it down and pack it all back into moving trucks. I knew that a lot went into planning and executing a race, but the sheer volume of STUFF to pack up and move was astounding. Eventually, we were released and headed home. The good thing about a race starting at 8:45 is that you don’t need to get up super early to make it to the race start. We got up about 6am and slowly started to get ready. I decided to wear a pair of tights and a lighter long sleeved shirt with a hood and my Chicago Marathon jacket over that. 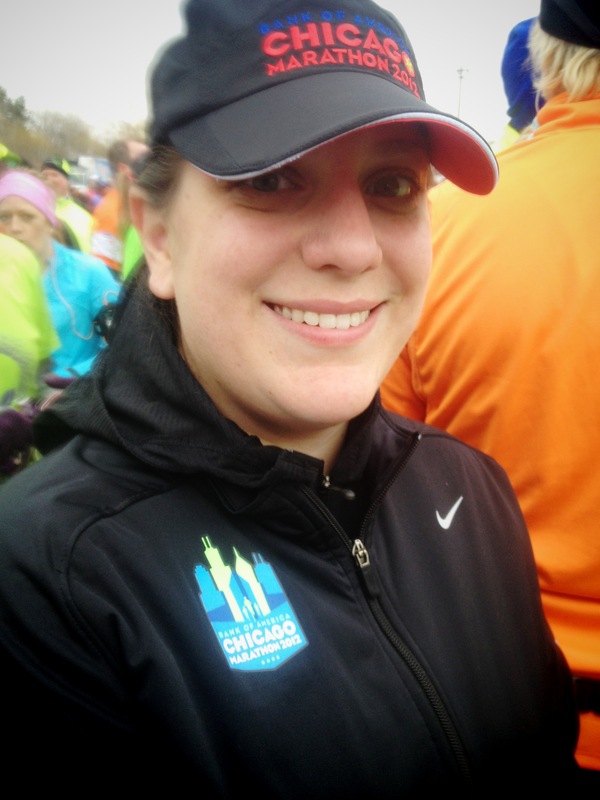 I also wore my Chicago Marathon hat – not because I wanted to be a walking advertisement for the Chicago Marathon but because I wanted a hat to keep the rain off of my face. I had planned on parking in a surface lot with meters and had money to pay for the meters, but unfortunately, the lot was full! Luckily, Ron had grabbed some cash, so we parked at a garage a bit further away. We made our way to the start line and directly to the port-o-potties, even though I’d used the bathroom approximately 1,000,000 times at home. All morning I’d had the strangest feeling about the race. It didn’t seem real that I was running a half marathon. I wasn’t worried about being able to finish, I knew I could. I wasn’t trying to PR or meet a time goal. And yet, I was strangely nervous. Nervous or not, it was soon time to line up. There are no waves in this race, and I didn’t see any kind of indication of where to line up for what pace, so I just had to guess. (After the race started, I saw an 8:00 minute and a 10:00 minute sign, but they were extremely close to each other and I’m not sure how accurate they were). The race didn’t start on time – don’t know why – but eventually we were moving! Read to go! And an unintentional walking billboard for the Chicago Marathon. The course IMMEDIATELY narrows, which caused congestion right after crossing the start line. I don’t know why it was set up like this, but it was frustrating to be immediately stopped. 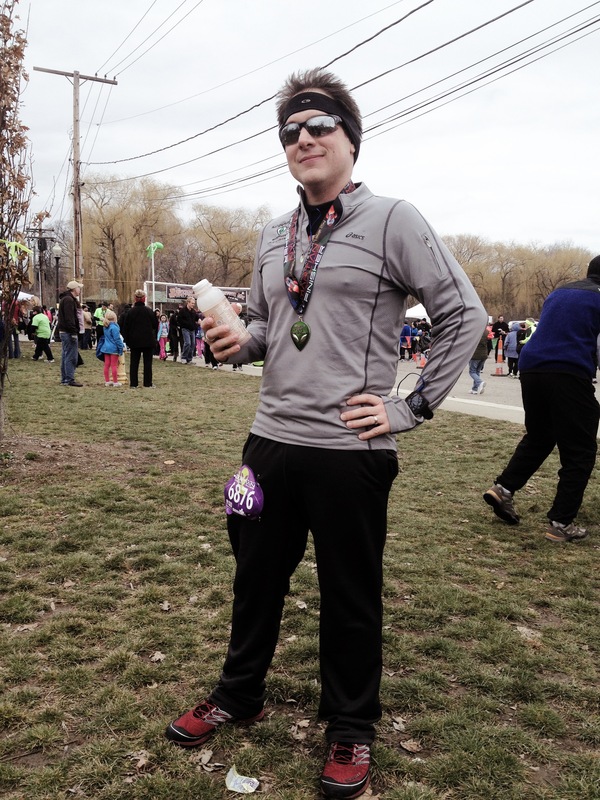 Since I wasn’t gunning for any particular time, I tried to just stay patient and not weave around other runners. This worked out for me for probably the first time ever and I didn’t really have to weave around anyone. Late in mile 1 my left leg started to cramp. I knew I’d need to stop and walk the cramp out. Walking after a mile in a half marathon was not my plan! But I knew once the cramp was gone, it probably wouldn’t come back, so I pulled to the side. I also retied my shoe. And I still managed to run the second mile in 11:10. This was stupid. My Garmin only gives me average per mile pace, so I don’t know exactly how fast I was running, but I’m pretty sure it was under 10 min/mile. Too fast too early in the race! Mile 3 starts with a nice downhill onto Hines Drive and into the parks. We saw some marathoners (who had started at 7:15am) coming back to finish their first loop (the new course was 1 loop for half marathoners and 2 loops for marathoners). Soon I noticed the 10K turn around point. It seemed to come up so quick! The race seemed to take a lot longer when I was running the 10K last year, but here I was passing the turnaround and it seemed like no time at all had passed. We ran another mile in the park before the original course and the new course diverged. We made a left turn into some neighborhoods. Volunteers were handing out Gu, but it was still pretty early in the race, so I didn’t take any. In hindsight, I should have taken the Gu and the water at the water stop because it would be awhile before I saw another water stop. The course through the neighborhoods was a bit narrow because runners were running both out and back along neighborhood streets. There were also still some cars parked along the street, but with the last minute course change, I can’t really fault the residents for not moving their cars. In fact, I know it must have been a hassle to suddenly find your street shut down for hours on a Saturday! I was running strong through the first part of the neighborhoods when we came back out to a larger road before turning into another neighborhood. I figured we’d pass the main water stop we’d seen going into the neighborhoods, so I took a Gu. It turns out we didn’t pass that one again yet, but there was a small water stop before a turn and as I angled to grab a cup, someone stopped right in front of me. I managed to grab the water and then was going for Gatorade when Ron did about the same thing. This all slowed me down some, as did the hill I suddenly found myself facing. I was so thirsty from this point on until I reached another water stop. Through the second set of neighborhoods, my time was slipping. I felt a bit of disappointment, but I reminded myself that this was still just training, not my goal race. Through all of this, the mile markers were coming before my Garmin beeped and I wondered if the course was going to be short. Since it was a new course, the race would need to certify it after the fact. Finally we were back on Hines Drive but instead of turning right to head back, we had to turn left to go just a tiny bit further before turning around. I’m sure it was just to get appropriate mileage in, but it was kind of funny how little we ran in that one direction just a little bit before turning around. Around mile 10 or 11, we turned off of Hines Drive and onto the Rouge River Gateway trail. This is one of my favorite places to run in Dearborn, except for two things. The two bridges over the river. Whenever I run across them, they bounce and make me dizzy. With a lot of people running over them, the effect was that much worse. The bounce doesn’t coordinate with my footfalls, which is what makes it so bad. I stopped, grabbing the side of the bridge for balance and walking the rest of the way over it. Right after the bridge is a pretty steep but short hill. I started running again, even up the hill, but I still felt like I was on that damn bridge. A few minutes of walking cleared my head and onward we went. With a bit more than a mile to go we reached a downhill. Like I said, this is one of my favorite parks to run in, and I knew the rest of the course. I always let this hill carry me as fast as it can and today was no exception. I was behind Ron so I told him, “Go!”. Down the hill we went, over the other bridge which thankfully wasn’t as bad. Slowed on the uphill to get out of the park, tried to stay strong as we ran back on the road, turned a corner, and another downhill to power down. Then just a little bit further, turn the corner, and give it everything you have left in the finish chute. I chicked one older gentleman, with Ron running by on one side and me on the other. And finally, we were done. I grabbed my medal (still in the bag), a cookie, some water, and some chocolate milk. I found a picnic table and sat down, eating my cookie, putting my medal around my neck, and chugging my chocolate milk. After a few minutes, we started hobbling back to the car. I’d had half a mind to watch the kids race, but I was so cold and just wanted to go home and change. Ron said he did it for the Chocolate milk. Overall, I’m pretty happy with this race. I’m annoyed that I stopped to walk around mile 9, and by my inconsistent pace. But this wasn’t a goal race and I hadn’t tapered at all, so who knows what would have happened had my legs had some rest. I’m amazed that I knocked off 7 minutes from my best half marathon time of 2012… without really trying to beat that time AND I still walked. I calculate that if I had run the whole thing, I’d only be a minute or two off of my PR. On the one hand, this race wasn’t really the confidence boost going into Nike that I’d hoped it would be. 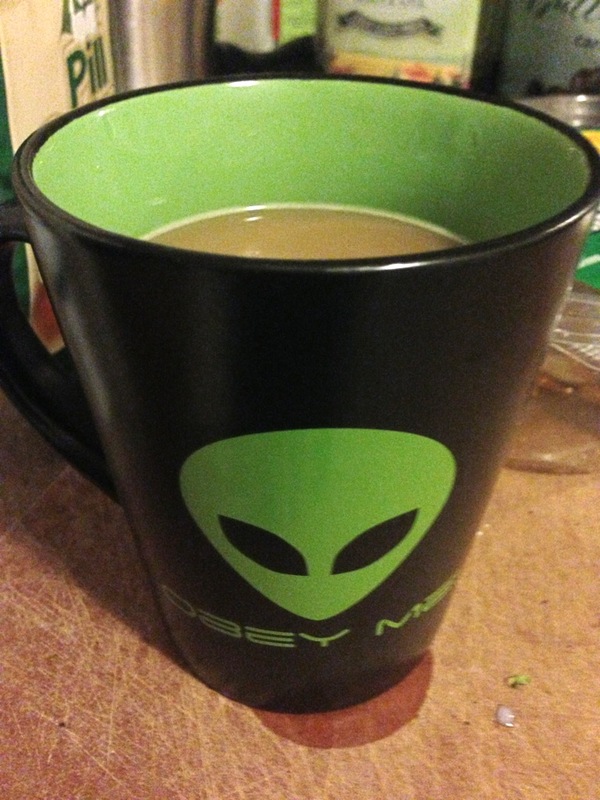 On the other hand… a proper taper did wonders for me in Chicago, so maybe it’ll work again. Race shirt, medal you can’t see, and a half zip I bought at the expo. 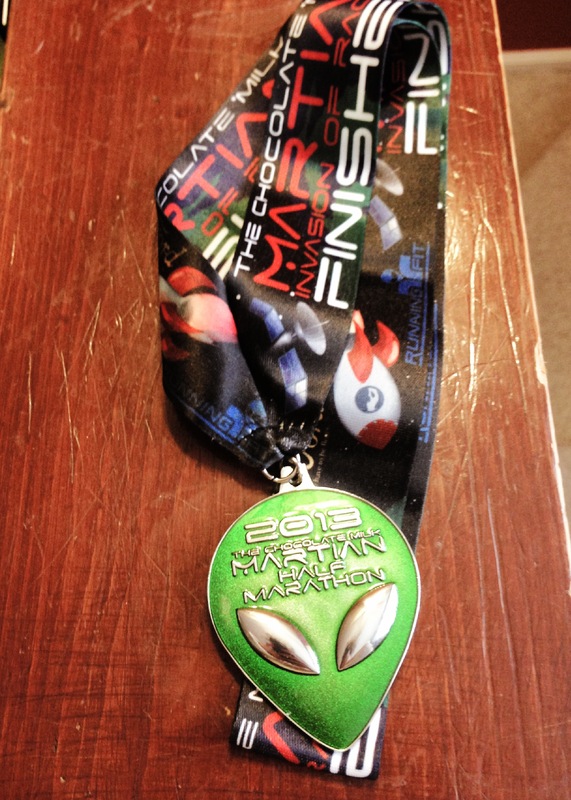 Great recap and um, we both ran Chicago Marathon 2012, Martian and I too am headed to NIke this weekend!